Double-click on a map document to open it. Select it in the ArcMap Getting Started dialog box. In Windows Explorer, navigate to the map document's location. When you start ArcMap from the Windows Start menu, you'll see the ArcMap Getting Started dialog box. 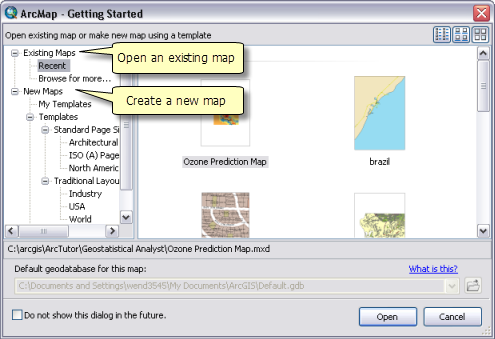 Select an existing map or browse to it to open it in ArcMap. Click the Open button on the Standard toolbar (or use the shortcut CTRL+O). Double-click on a map document in the Catalog window. Use the Search window to find a map and double-click to open it in ArcMap. Be sure to save your work in your existing map as it will be closed when the new map is opened.